Overview - The heroic story of a dictator who risks his life to ensure that democracy would never come to the country he so lovingly oppressed. Music Video: Best Love Song - "Your Money's On The Dresser"
Known for his mixture of intelligent, confrontational satire, outlandish characters, and shocking gags, British comedian Sacha Baron Cohen has made quite a name for himself over the years. Through his original projects and supporting roles in other films, the actor has cemented his place as a chameleon of sorts (much like Peter Sellers before him), capable of inhabiting various, eccentric characters and personalities. In 'The Dictator,' Cohen once again disappears into a comically exaggerated role, fully becoming the farcical ruler Admiral General Aladeen. While the character is entertaining, the film unfortunately lacks a lot of the bite and intelligence that elevates the performer's best work. Sure, there are plenty of outrageous, offensive gags and a few insightful bits of satire, but for the most part, 'The Dictator' feels uninspired and conventional. Still, the film is certainly funny enough to remain worthwhile, even if one can't help but feel a little disappointed. The story follows the exploits of an outlandish dictator, Admiral General Aladeen (Sacha Baron Cohen), who rules over the fictional Republic of Wadiya. When he is invited to speak at the United Nations in New York, the despot is kidnapped and replaced by a double. Now penniless, powerless, and most devastating of all, beardless, the former tyrant is forced to get a job at a health food store. With the help of his former weapons chief (Jason Mantzoukas), he tries to uncover the conspiracy against him and regain his place as Supreme Leader. At the same time, he slowly develops feelings for his boss (Anna Faris), which awakens a softer, gentler side within the evil dictator. Torn between his hatred for democracy and his newfound love, Aladeen will have to decide what's more important to him. Much like Cohen's previous work, the film relies heavily on the comedian's extraordinary ability to craft fully formed, ridiculous characters, and as Aladeen the actor creates another memorable and bizarre persona. Sheltered from reality and oblivious to his people's actual perception of him, the part is played with a certain spoiled child, super villain mentality. In other words, as far as evil dictators go, it's a pretty accurate portrayal. As terrible and reprehensible as the character is, much like Cohen's similarly offensive creation, Borat, the actor somehow finds a way to endear the maniacal tyrant to the audience through a kind of wide-eyed innocence. Even when ordering numerous, unnecessary executions, he can't help but remain lovable, in a twisted sort of way. There are similarities to Cohen's previous personas, but the character stands alone fairly well. In fact, despite the movie's outrageous gags and sardonic humor, some of the funniest moments actually come from subtle facial expressions and mannerisms (I was especially amused by the way the dictator likes to hold hands with Ben Kingsley's character) or from Aladeen simply pronouncing things strangely with his silly accent. Another highlight comes in the form of Aladeen's partnership with Nadal (Jason Mantzoukas), the former head of his nuclear weapons program. Cohen and Mantzoukas share great chemistry and their arguments and conversations are among the film's funniest scenes (an exchange in a funeral home and prior to getting on a helicopter are my favorites). Early scenes set in Wadiya depict Aladeen in his prime and rely on some wonderfully exaggerated bits that satirize the ridiculous, egomaniacal behavior of real-life dictators. Once the setting changes to New York, the film switches gears, relying on a tried-and-true, fish-out-of-water culture clash story arc to drive the plot and comedy. Jokes are centered around the dictator's uneasy adjustment to civilian life in America, and his various villainous quips within decidedly mundane settings can be very entertaining. Unfortunately, the film's gags don't always work, and the movie isn't as consistently funny as one might hope. A few of the immature jokes feel tired and recycled, and a lot of Aladeen's antics can get repetitive. The comedy is also very juvenile, and while that's not really a bad thing, the film's satire isn't as sharp as it could have been. There are some interesting observations, but outside of a hilariously insightful monologue comparing dictatorships to America's "democracy," the movie lacks much in the way of biting or intelligent social/political commentary. Without the benefit of shocked reactions from unsuspecting real-life individuals (as found in 'Borat' and 'Bruno. 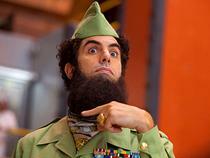 '), 'The Dictator' has to rely completely on its own scripted material, and unfortunately, it's not always up to par. While I think that Cohen is one of the most creative comedians working today, he seems to be funniest when he's feeding off of actual people who aren't "in" on the joke, and here he's unable to do so. There's still an improvisational aspect to the production, but the plot is actually rather basic and disappointingly conventional. Likewise, though the comedy can be very twisted, the writers' attempts at shock humor don't feel as inspired as in the star's previous work (though a bit involving a "talking head" is hilarious), and the whole affair is just kind of dumb. The brisk running time flies by and in the end, there just isn't much to the whole thing. Thankfully, despite the immaturity and comparatively weak satire, the movie still manages to be funny, and though uneven, I'd say there are more hits than misses. 'The Dictator' isn't as inspired as some of Cohen's previous work, but despite its flaws it's still an entertaining flick. The comedy can be extremely juvenile, but there is some decent satire peppered throughout as well. Some of the gags and jokes end up missing, and while disappointingly uneven and traditionally structured, the movie is still funny. I prefer Cohen's unscripted efforts, but there are some genuinely creative and hilarious moments here -- just not as many as I would have liked. Alternately gut-busting and eye-rolling, this is an inconsistent but enjoyable comedy. Of course, if Supreme Leader Admiral General Aladeen is reading this, please dismiss all of my criticisms. They are clearly meant in jest, as this is undoubtedly the greatest comedy of all time. Now please, let my family go! 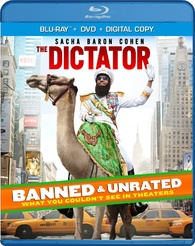 Paramount presents 'The Dictator' in a Blu-ray/DVD/Digital Copy combo pack. The BD-50 disc is housed in a keepcase with a cardboard slipcover. The release contains the original theatrical version and an unrated cut which adds about fifteen minutes of footage. Most of this material amounts to extensions of existing scenes, and while a lot of the additional jokes are actually very funny, they start to drag out the pace. The most substantial inclusion is a rather outrageous fight scene between Aladeen and one of his former female bodyguards who uses a very unique weapon (to say the least). A separate DVD (with the theatrical cut only) and instructions for a downloadable UltraViolet digital copy are also included. After some logos, warnings, and skippable streaming trailers, the disc transitions to a standard menu. The movie is provided with a 1080p/AVC MPEG-4 transfer in the 2.40:1 aspect ratio. With its slightly stylized appearance, the picture looks good but a bit uneven. The digital source is mostly clean and artifact free, but there is some noise visible in darker scenes. Detail is good, offering solid clarity, but some sequences can have a fairly soft and dim appearance that lacks depth. With that said, certain shots (particularly wide shots of New York and the fictional Republic of Wadiya) offer impressive levels of dimension. An early scene where Aladeen addresses his subjects is especially noteworthy, with lots of detail visible in the massive crowd. The color palette veers toward a deliberately stylized aesthetic that favors saturated teals, oranges, and yellows. While intentional, the resulting style isn't always very appealing, and skintones often have an orange tinge to them. Contrast is well balanced and black levels are mostly consistent. It should be noted that the unrated cut of the film is more problematic. The additional scenes tend to stick out with different color timing and a slightly unfinished look (chroma key work is much more apparent). To make matters worse, the majority of the extended material comes right in the middle of existing scenes, which causes the unrated cut to look pretty inconsistent, even within individual sequences. This isn't a huge concern as most will probably want to stick with the theatrical cut anyway, but it does detract a bit from the experience. 'The Dictator' carries a solid transfer free of any major artifacts or technical issues. The film's style is a little uneven, but there are some nice instances of sharp clarity and dimension mixed in with other comparatively average looking scenes. The film is presented with an English DTS-HD MA 5.1 track, and Spanish, French, and Portuguese Dolby Digital 5.1 tracks. Optional English, English SDH, Spanish, Portuguese, and French subtitles are included. While not totally immersive, the mix carries an occasionally lively, robust kick that works well with the content. Speech is clear and easily heard throughout, but there is some minor peeking and crackle in the high frequencies (particularly around the 00:47:30 mark). Though the flick has some fairly quiet stretches, the soundstage opens up during specific scenes with a pleasing, spacious sense of atmosphere. Surround use can be sparse, but ambiance (crowd reactions, city noises) does make its way to the rears. The playful score and music selection are also spread nicely around the room, and carry some aggressive low frequency activity. With the exception of the aforementioned peeking, dynamic range offers clean highs and deep lows with no major distortion. All of the audio elements are balanced together well. With a decent sense of atmosphere and a punchy soundtrack, 'The Dictator' sounds pretty good. The sound design is basic, but the technical presentation is solid. Paramount has provided a surprisingly sparse assortment of supplements. In addition to the aforementioned unrated cut, we get some deleted scenes and a faintly amusing music video, but that's about it. Considering how outrageous Cohen's productions and promotional hijinks can get (his in character run-in with Ryan Seacrest at the Oscars was quite funny), I'm surprised by the lack of material here. All of the extras are presented in 1080p with Dolby Digital 5.1 audio and the same subtitle options as the main feature (unless noted otherwise). Deleted and Extended Scenes (HD, 34 min) - Fifteen deleted and extended scenes are viewable separately or together. A lot of this material is already included in the unrated cut, but there are some additional/alternate jokes and full sequences here as well (including an amusing explanation for why Ben Kingsley's character was skipped over in the line of succession). Most of this material seems to have been cut for time, and the scenes are really funny on their own (I especially like a repeated joke about the Broadway production of 'Billy Elliot'). Music Video - Best Love Song "Your Money is on the Dresser" (HD, 2 min) - An amusing music video for a song by Aladeen is included which features Cohen's wife Isla Fisher. Larry King Interview (HD, 3 min) - An extended version of the Larry King interview featured in the movie is included with Dolby Digital 2.0 sound. 'The Dictator' is a funny but uneven comedy from Sacha Baron Cohen and director Larry Charles. While a lot of the celebrated performer's comedic trademarks are present, the end results lack consistency, and the filmmakers' satire isn't as sharp as it could have been. While there are a few issues here and there, the video transfer and audio mix are both very solid. Outside of some amusing deleted scenes, the special features are disappointingly slim. The flick is a little underwhelming but entertaining, and though not as packed as I would have liked, this is a decent disc. Give it a rent.